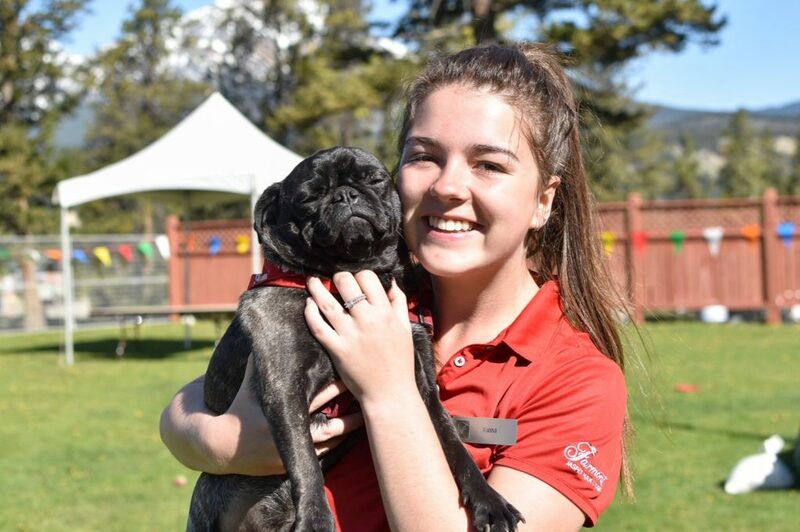 Each May for the last four years, the Fairmont Jasper Park Lodge “goes to the dogs” for a weekend with its Dog Days of May event. The Dog Days of May is a weekend full of activities for your pooch! The Fairmont Hotels & Resorts have always been pet-friendly (most locations have their own canine ambassadors!) and the Dog Days of May event was created primarily to help people celebrate their pet children (they’re family, so why can’t they participate in long weekend celebrations too?). It’s also a way to build awareness that the hotel is an incredibly dog-friendly one. You can bring your pet to the JPL any time of the year – but I’d recommend planning a trip especially for this paw-some weekend. We were so excited to take Olive and Artie to this event – joining 60 other dogs for an experience I think we’ll remember forever. 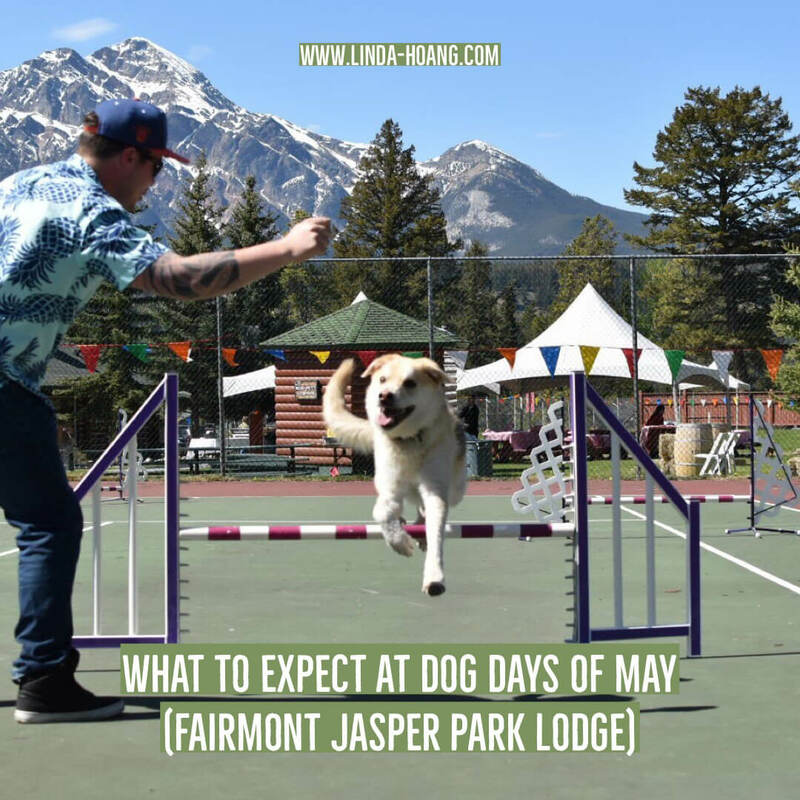 Below is a short video I put together of our Dog Days of May weekend, and a recap of what to expect when you take your pooch to the Dog Days of May at the Fairmont Jasper Park Lodge! Olive and her new friend Miss Maddie the Dashie. 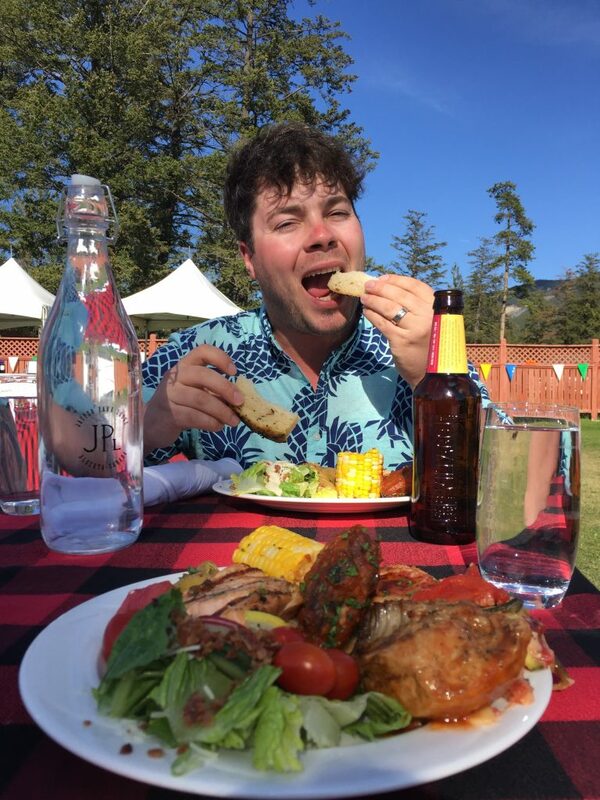 As Mike said to me after I asked if he looked at the Dog Days of May itinerary, “it sure doesn’t seem like there’s many human activities.” Ha! It’s true, the itinerary at Dog Days of May is primarily focused on the pooches. 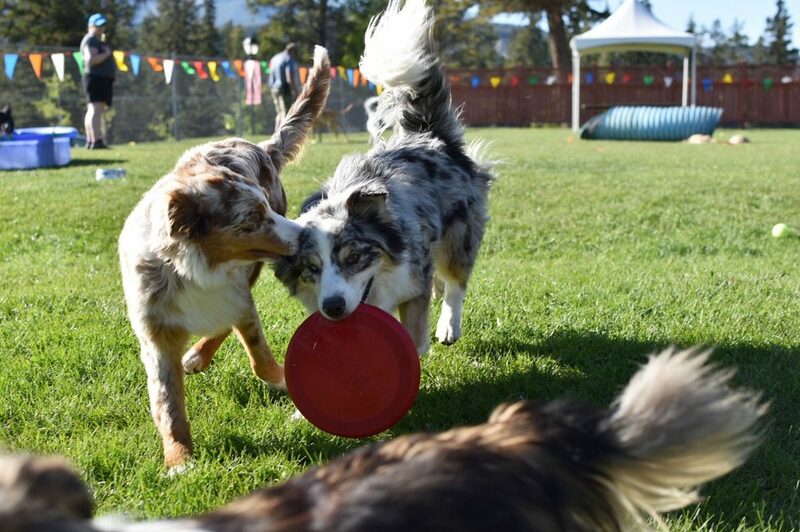 The ‘Fun Zone’ Off Leash Area in the Outdoor Activity Centre is the main activity centre, with a dog agility course, doggy pools, lots and lots of tennis balls and frisbees to be thrown, and a ‘dog spa.’ It’s also the meeting point for dog hikes and nature walks. It’s safe to say Olive and Artie were exhausted after participating in Dog Days of May activities! Zambuca and Daiquiri playing at Dog Days of May. Meals included in your Dog Days of May package! Spending the weekend with your dogs is one thing. 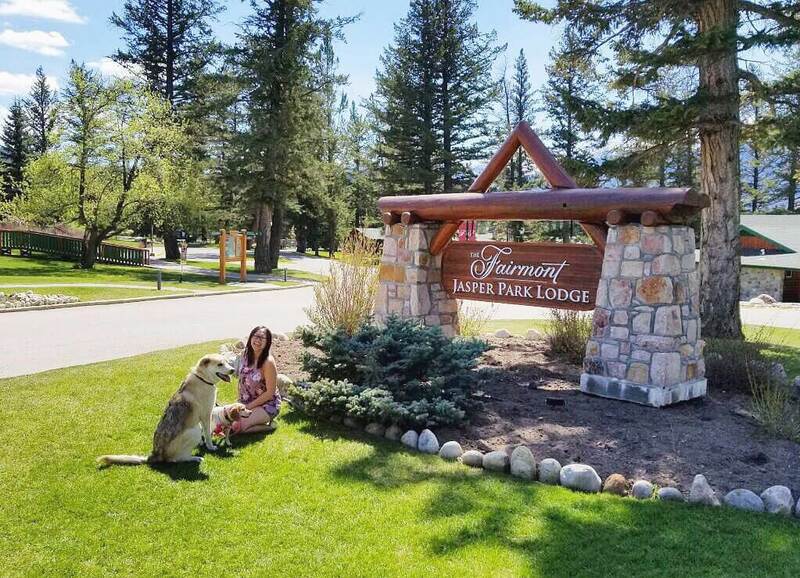 Spending the weekend with your dogs in beautiful Jasper, Alberta at the Fairmont Jasper Park Lodge is on a whole other level. We were lucky to have gorgeous weather for the Dog Days of May, sunshine and blue skies the very picturesque JPL overlooking the Canadian Rocky Mountains and Lac Beauvert. 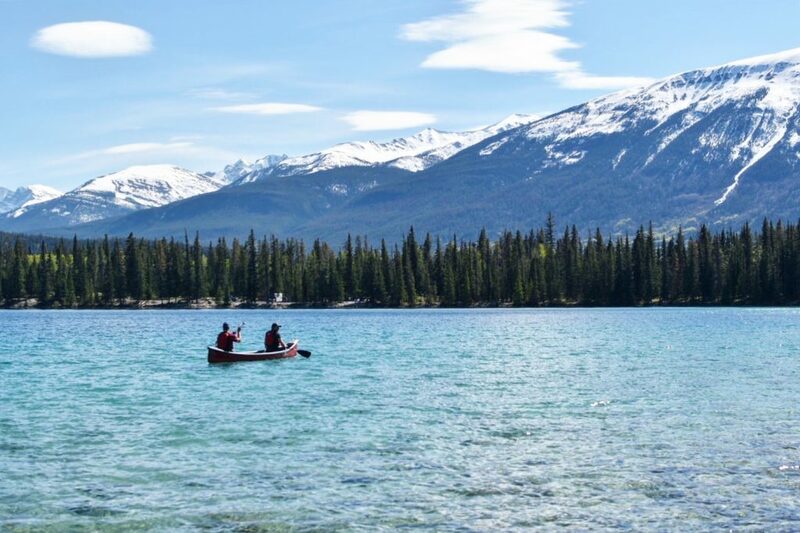 Gorgeous views from the Fairmont Jasper Park Lodge. Dog Days of May staff LOVE dogs! 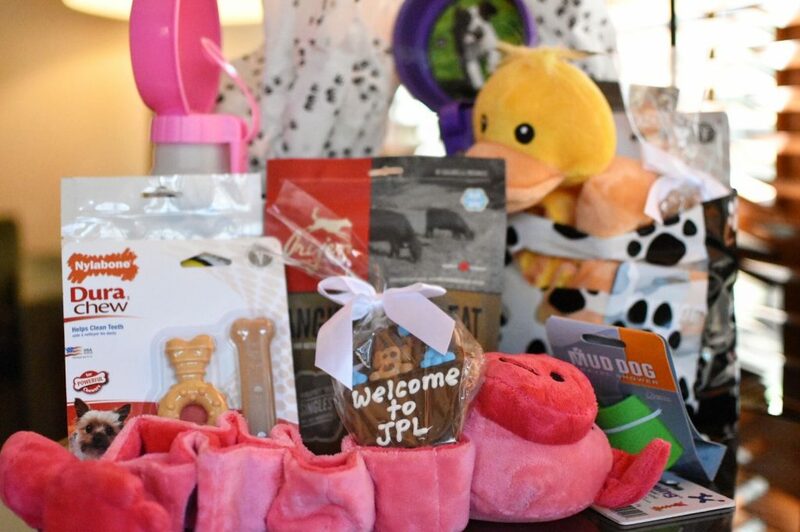 Thanks for all the dog swag, Bone and Biscuit! 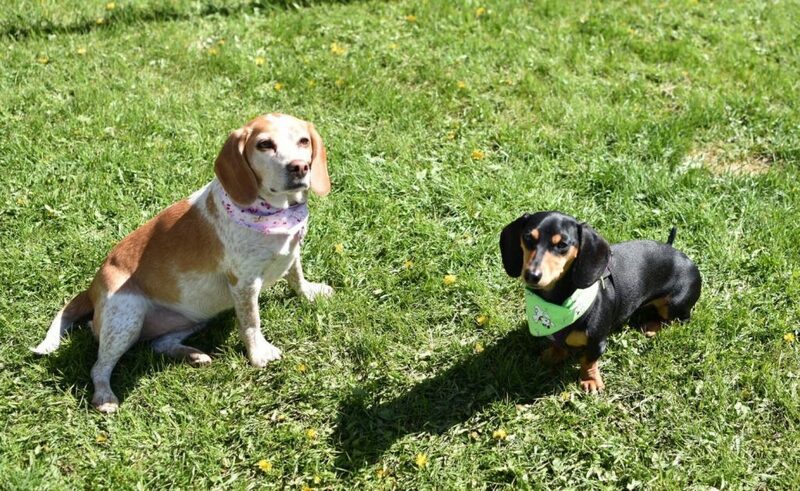 Olive and Artie had such a great time at Dog Days of May. They made tons of friends, ran a lot, ate a lot, and were just so doggone happy. Artie got a lot of lake time too, learning how to swim and just having the time of his life. Olive got an unbelievable amount of cuddles. Everyone (dogs and humans) were just so happy. Gorgeous long weekend with my furbabes at the Fairmont JPL. Mike and I were invited guests to Dog Days of May this year, and are feeling so grateful for the opportunity. We met some amazing dogs and their wonderful fur-parents, and it was just such a beautiful and busy weekend – one that we definitely want to replicate next year. As I mentioned, this year’s Dog Days of May was the biggest yet, with 60 dogs and 90 people. I can only imagine next year will draw even more people and pooches. Some of the suggestions I’ve made for next year include adding a doggy fashion show to the agenda (lol!) and a giant dog ball pit. The human food area is also merged with the dog food area outside, which resulted in some pretty beggy dogs, and close calls for dogs swiping food. There was also a minor dog biting to get food instance (but was minor), but still maybe worth considering splitting up the human food from the dogs (but still having them be in the same area). The package includes all breakfasts, lunches and dinners during the weekend so you don’t need to plan to go anywhere else or spend anything else on food while here, though we did visit the lounge a few times for drinks, chips and appetizers in between meals. Mike also wanted to note that each human gets two free drinks at the bar during dinners, lol. It doesn’t have to ALL be about the dogs all the time – though that’s really why anyone would pick this package, right? For your dogs! But there are enough activities scheduled where most of your day could be devoted to your dog’s entertainment, but there will be times where your dog could just be in the fun zone and you can go off to do your own thing, or after a very exhausting day when your dog just wants to sleep back in your cabin, is another opportunity to sneak off on your own. There’s also opportunities to walk and explore with your dog away from the bigger group too! The event is rain or shine, so we lucked out because it was gorgeous but the last few years it was pretty rainy. Something to keep in mind! We had an amazing time but I don’t know if it would’ve been the same in rain (though there were people there this year who had been in previous, rainy years and still had enough fun to want to come back this time lol). Book early! Packages started at $534 per person (based on double occupancy) however those rates quickly booked up and the closer you get to the weekend, the pricier the rates (and you risk missing out because there is a sell-out point for the event). If you’re planning on attending next year, make sure you book it early on! And below is even more photos from our weekend! I hope to have many more weekend adventures with my pooches, and I hope the same for you! Be sure to keep an eye out on the Fairmont JPL’s page for when registration opens for 2018’s Dog Days of May! Disclaimer: I will always provide my 100% honest opinion on this blog. I attended the Dog Days of May as a media/blogger guest. This has no impact on opinions stated in this post (I love the JPL + truly had a fantastic experience at Dog Days of May with Olive and Artie).